Native insects evolved along with the few plants that are able to survive in the alpine/aeolian ecosystem. Relationships among insects and plants in this ecosystem are only partially understood, but native insect pollinators are known to play a crucial role in plant reproduction. 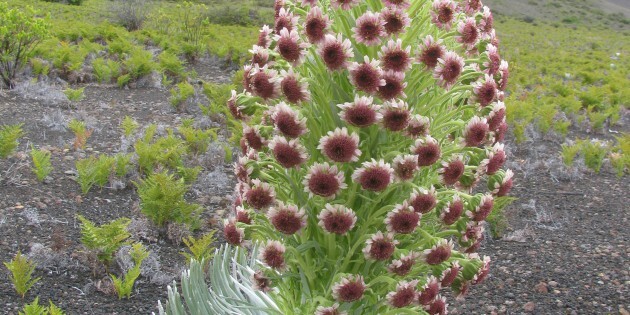 For example, insects are critical links in the reproduction of ‘āhinahina, the Haleakalā silversword. This well-known endemic plant cannot self-pollinate. Today, native insects in the alpine/aeolian zone are threatened by the invasion of non-native insects such as the Argentine ant. Native arthropod species (many of which are endemic to Haleakalā) evolved without ant predators because there are no ant species native to Hawai‘i. To date, more than 40 species of ants have been collected in the Hawaiian Islands. Among these is Linepithema humile, the Argentine ant. This ant is of particular concern to resource managers and researchers at Haleakalā National Park. Unlike most other ant species that tend to be limited to sea level and lowland areas, the Argentine ant has become established at higher elevations. Researchers have identified two separate populations within park boundaries. These populations have been steadily expanding. In this unit, students learn about the interdependence of native insects and plants in the alpine/aeolian ecosystem. They also learn about a threatening, invasive species of ant and what is being done to control the spread of these ants. Students propose a response to a management dilemma that arose in 1968, involving protecting ʻahinahina, Haleakalā Silversword, from insect damage. Students compare the invasive Argentine ant to other ant species to understand why the Argentine ant is such a potential threat to the alpine/aeolian ecosystem of Haleakalā. In teams, they teach each other about the threat Argentine ants pose. Students propose ideas for controlling the spread of Argentine ants in Haleakalā National Park, compare their ideas to what’s already being done, and evaluate the efficacy of current control efforts. Five or six 50-minute periods. 1. How do native plants and arthropods depend upon each other in the alpine/aeolian ecosystem? 2. What are the impacts of alien invaders such as the Argentine ant? 3. How do the role of native species and the biological and behavioral characteristics of alien species affect natural resource management decisions? Insect management in the alpine/aeolian ecosystem. Relationships among insects and plants in the alpine/aeolian zone are only partially understood, but native insect pollinators are known to play a crucial role in plant reproduction. Invasions of alien insects threaten native insect populations and the native plants that depend upon them for pollination. • Do Internet research to find out more about the current status of silverswords on Maui and recent research on silversword ecology. • Have an ant-baiting competition. 1) Where did your group choose to place its bait card? Why do you think this is a likely place to attract ants? 2) Which bait do you think ants will be most attracted to? Why? 3) What other insects or animals do you think will be attracted to the bait card? Why? Send student groups or representatives out to collect the bait cards and observe the presence of ants, the baits they are feeding on, whether there seem to be different kinds of ants present, and what other insects or animals are present. Have students check their hypotheses against their observations, and discuss differences. You may want to announce the “gold, silver, and bronze medal winners” in the ant-baiting competition. • Print the HNIS report on the Argentine ant. On pages 2-3, this report outlines methods used to control (or attempt control of) Argentine ants, including several chemical agents that have since been outlawed. Have students research one or more of these outlawed chemicals focusing on its environmental and health effects. In reporting their findings, ask students to write or talk about factors that should be considered in selecting chemical pesticides for use at home, on farms or gardens, or in agricultural areas. • Design an educational program or materials to help stop the spread of Argentine ants to other parts of Haleakalā National Park. HNIS (Harmful Non-Indigenous Species) report for the Argentine ant (Linepithema humile) can be downloaded here. Carr, Gerald, Elizabeth Powell, and Donald Kyhos, “Self Incompatibility in the Hawaiian Madiinae (Compositae): An Exception to Baker’s Rule,” Evolution, Vol. 40, No. 2, 1986, pp. 430-434. Kobayashi, Herbert K., Ecology of the Silversword: Haleakalā Crater, Hawai’i. Final Report Hale N-3, Hawaiʻi Natural History Association, 1973. Loope, Lloyd L., Arthur C. Medeiros, and F. R. Cole, Proceedings of the Conference on Science in the National Parks, 1986, Volume 5: Management of Exotic Species in Natural Communities, L. K. Thomas, Jr. (ed. ), The U.S. National Park Service and The George Wright Society, 1988, pp. 52-62. Loope, Lloyd L. and C. F. Crivellone, Status of the Silverswords in Haleakalā National Park: Past and Present. Technical Report 58, Cooperative National Park Resources Studies Unit, University of Hawaiʻi at Manoa, 1986. Medeiros, Arthur C. and Lloyd L. Loope, Rare Animals and Plants of Haleakalā National Park, Hawaiʻi Natural History Association, 1994.